Sleep Apnea is the stopping of breathing for short periods (typically between 10 and 90 seconds) during your normal nightly sleep. An apnea is just one occurrence. This can be repeated hundreds of times during the night, and is nearly always accompanied by snoring, which is usually quite loud. You will not be aware of this happening to you at all. The condition, obstructive sleep apnea occurs when the upper airway collapses as your throat muscles relax during normal sleep. When someone is lying down, there is a tendency for this to happen due to gravity. This causes a mechanical blockage, usually due to excess tissue closing down the trachea. The person tries to breathe, but can't due to the obstruction. Your throat starts to act like a one way valve. You can exhale, but can't inhale. The oxygen level in the blood falls considerably, then the heart pumps faster trying to compensate for this. Blood pressure rises. Eventually, the brain kicks in and wakes you up momentarily. You breathe normally again for a short while as you fall back to sleep, totally unaware that anything has happened. It is not uncommon for this to repeat every 15 minutes, thus interrupting a persons proper nightly sleep. This obstructive sleep apnea cycle continues throughout the night, resulting in the patient having excessive daytime tiredness and a lack of concentration. This can be a danger when working with machinery, heavy equipment, or driving any type of vehicle. If you are unaware of the problem, you assume that you're just not getting enough quality sleep. Because of a neurological dysfunction, the brain simply "forgets" or "delays" to send the signal to breathe. The resulting lack of oxygen awakens the person, who then resumes normal breathing. The cycle may continue as above, having similar symptoms. This type of sleep apnea is harder to treat, but some drugs are now available which may help. This is the combination of both obstructive sleep apnea and central sleep apnea. You can have varying degrees of one or the other i.e. 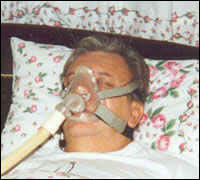 severe obstructive sleep apnea and mild central sleep apnea, or the other way round. This is extremely rare. If left untreated, sleep apnoea can be potentially life threatening. In addition, as sleep apnea causes daytime sleepiness, there is also a greater risk of accidents in the home, work or at leisure caused by a loss of concentration and tiredness. It is especially important for anyone diagnosed with sleep apnea not to drive for any lengthy periods, or to drive at all when feeling tired. Your doctor or specialist must by law (and ethically) inform the DVLA about your condition. If it is severe, your driving licence is usually suspended. If you get treatment and this is working to the satisfaction of your specialist, you can apply for your licence back. Sleep apnoea can also affect children, but thankfully it's rare. There are some that suspect there is a connection to infant cot deaths, but no evidence of this has been found as yet. If you have some or all of the above symptoms (especially the last one), it may be advisable to consult your doctor. Try taking the Epworth Sleepiness Test to see your score. You could then quote your Epworth Score as they will know exactly what this is. There are other things that can cause significant daytime sleepiness, so your problem may not be sleep apnea. The most common of these is medications, particularly antihistamines, tranquillizers, and psychotropic drugs. Another is depression. Please note that with depression, some may be unable to sleep while others can't seem to get enough sleep. The first step is to try and lose weight, stop smoking and reduce your alcohol intake. In some cases of very mild sleep apnea, sleeping on your side instead of your back can help. If you have been referred to a specialist, you will be given the standard Epworth Sleepiness Test. He may also make arrangements for a comprehensive sleep-study. 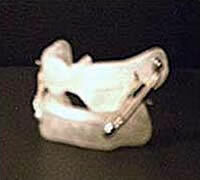 The next step I went through was to try a Orthodontic dental appliance which looks rather like a gum shield. It draws the lower jaw forward, making more room at the back of the throat. Spacers are added each month to gradually increase the pressure pushing forward on lower jaw. These are usually made and fitted by a dentist or orthodontist. Try to image what it's like to sleep with this thing in your mouth all night, but I'm told it does work for some people. Didn't work for me. The CPAP machine (Continuous Positive Airway Pressure) has proven to be the most successful treatment for severe sleep apnea sufferers, but there is a shortage of CPAP machines as they are extremely expensive. This is a medical air pump which is connected via plastic tubing to a nasal or full-face mask. The pressure on the pump is set just high enough to stop the airway collapsing. 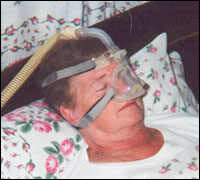 Some people find they can't tolerate using a CPAP machine due to the strange experience of having air forced into the lungs. I have met some patients who couldn't bear to have the mask over their face, yet others don't seem to have a problem and some say the noise lulls then to sleep. 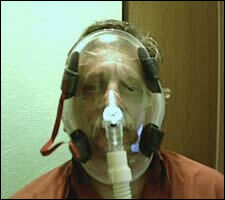 The CPAP machine certainly does work for OSA and is also a complete cure for snoring. The Bi-PAP machine is similar to the above machine but is easier for the user to exhale, due to it's bi-level pressures. Bi-PAP machines are not issued very often, due to their excessive cost. Trimming nasal passages and removing polyps and other growths to improve nasal breathing. Straightening a deviated septum (the middle bit inside your nose) also to aid easier nasal breathing. Laser-assisted uvulopalatoplasty (LAUP) using a laser to remove excessive tissue and tightening the throat. Mainly, this operation is used to stop snoring but not always successful and very painful. Uvulopalatopharyngoplasty, luckily there's an abbreviation for it (UPPP), which entails removing the uvula (the dangly thing at the back of your throat) plus excess tissue at the back of the throat and part of the soft palate. This is a most unpleasant operation and it didn't cure my OSA. You have to re-learn how to drink, as it can go down the wrong way. A tracheostomy (alternative spelling tracheotomy) can be done in severe cases where all other treatments have failed. This is the ultimate solution to obstructive sleep apnea, but don't consider this option without a great deal of thought. Some photos of this in the Tracheostomy page.